Well known amongst the residents of Disney Castle as both Donald's uncle and a lover of money, Scrooge McDuck made his new home in Hollow Bastion and started a new business of recreating his favorite childhood ice creams. 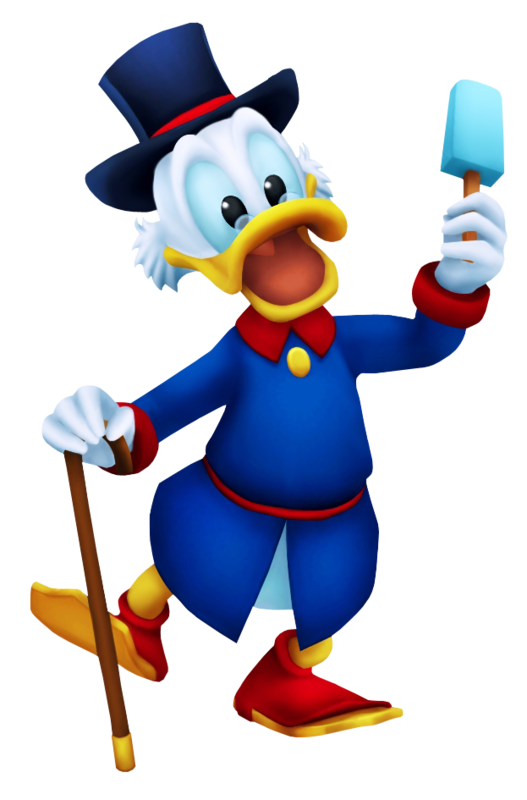 Throughout their adventure, he offers Sora, Donald and Goofy various flavors and stages of his development in order to obtain that salty-sweet wonder. An entrepreneur and shop owner from Disney Town who traveled to Radiant Garden with the wizard Merlin's help. He is one of the few people who knows about the existence of other worlds and uses this knowledge to expand his fortunes. Scrooge is saved by Ventus from the Unversed while the young man was running after Terra. Although Ventus was in a hurry, he is surprised when Scrooge tells him that he knows Ven was from another world. To show his gratitude, the old duck gives him three lifetime passes to Disney Town - for one child and two adults, much to Ven's embarrassment. Aqua meets Scrooge some time later and asks if he had seen a boy pass by. She was actually looking for Terra, but Scrooge thought she was looking for Ventus and unintentionally gives her the wrong directions. He comments that she was such a polite young lady. He is seen at the end selling (what would become one of his greatest innovations) sea-salt ice cream to Lea and Isa.